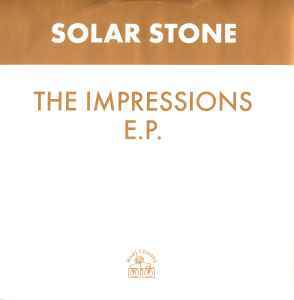 Solar Stone* ‎– The Impressions E.P. Special thanks to Bryony for "The Calling". Remix and additional production for Sunship Productions. This record is dedicated to the memory of Rory Mellors. ℗ 1997 Hooj Choons Ltd.
© 1997 Hooj Choons Ltd.
Track positions denoted by C & D.
What can i say about this tune! Back in the day Hooj was responsible for releasing such great tracks and i think that this one is easily one of their finest.Hooj's honcho Red Jerry takes all the credits for his work Powerfull bassline with percussive stabs, a memorable vocal plus a killer melody near the end! Still remember Sasha dropping this at 3am at Cream in Liverpool and getting hysterical respond from the crowd. the other mix from sunship is also beautiful but can't beat the power of Red Jerry's mix. Highly recommended!